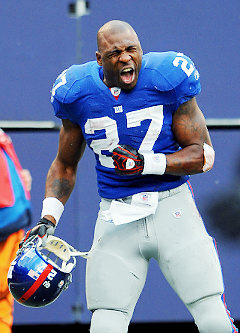 I think the story of 6-year old little Joe sending all the money in his piggy bank to Giants football player Brandon Jacobs is heartwarming and adorable. Though he was misguided into thinking that Brandon's statement of 'needing more money' meant he had none, it still was a kind gesture. If I had a son I would tell him how kind his heart was for trying to be helpful, but I would also see there's a brewing problem and would have to be honest with my son. I would probably wait a day or two and then explain to my son that I waited because I wanted him to enjoy himself and he should feel good about what he did because it came from the heart. After waiting, I would have to explain to him that it's OK to admire a sports player or entertainer but he should never become fixated on one to where you give them all your money. I would encourage him to have real-life tangible heroes around him that he can speak to. I would ask him who does he consider a hero in his life? Then, I would leave it at that and not pound what I said into his head, but I would watch my son and observe my behavior to make sure I'm not sending an ENERGY of praising athletes and entertainers. It's OK to admire the talent of an athlete or entertainer, but when an emotional attachment is developed as if the celebrity is a close friend or family member, that's dangerous. They should never feel as if they know the person personally. Emotional attachments to athletes and entertainers contributes to the youth growing up and subconsciously looking for cues and direction from celebrities they admire. I grew up in a musical household but I never saw my Mom or Dad go ballistic over a celebrity or seem to idolize them. I felt more of an ENERGY of appreciating their talents. We live in a society where the youth are sent the message that athletes and entertainers dominate over all the everyday people they know. They are taught that celebrities are better than and more admirable than all other people around them. I think parents should be more conscious of how involved their children become when it comes to their praise towards a celebrity. Of course I go by ENERGY so if I had a son and he did what Joe did I would end my conversation by giving him a kiss and another $3.36 and tell him now he has $6.72 and that is for his piggy bank and for his future and for no one else.